In this tutorial, you will learn how you can easily export content from KM that is ready to be imported directly into Sick Submitter. Assuming you have set up your campaign, and you are ready to build and export it. – Sick Submitter Articles. Choose this one if you are submitting to web 2.0 or article directories. – Sick Submitter Bookmarks. This template will export bookmark descriptions. 3. 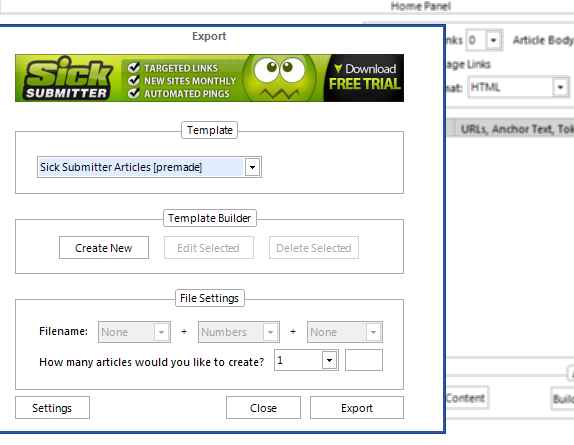 Select how many super-spun articles you would like to create. Note that each file uses nested spintax so it will give you quite a lot of variations. Click Export. 4. Sick Submitter will populate all fields with the information generated by KontentMachine so you can go on with your backlinking campaign. Click Preview to see how different each variation is.